Adidas is giving out free gear at two digital vending machines in Boston and Los Angeles during the 2018 World Series between the Dodgers and Red Sox. There's nothing quite like free stuff. Fans in Boston and Los Angeles have reason to be excited. Not only are their baseball teams facing off the 114th edition of the Fall Classic, but they're also getting an early Halloween treat courtesy of sports apparel company, Adidas. Adidas has announced that they have installed digital vending machines at two locations in Boston and Los Angeles where Red Sox and Dodgers fans can get free gear during the World Series. 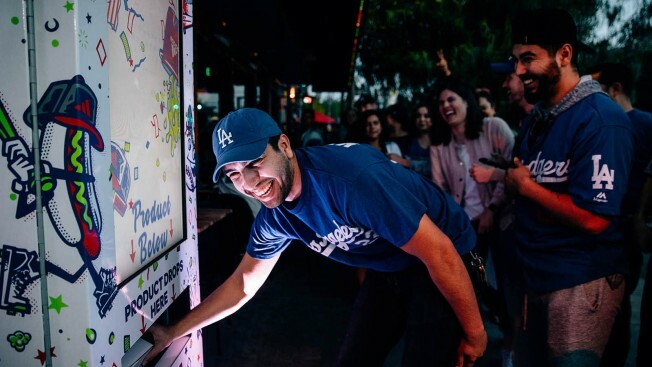 Tony C's Sports Bar & Grill in Boston and 33 Taps in Los Angeles are the two sports bars where the digital vending machines are located, and fans at each location can receive free prizes such as t-shirts, autographs, and other gear courtesy of Adidas. According to the company, the prizes will change throughout the game depending on how each game plays out. For example, if Adidas athlete Justin Turner hits a home run, then the vending machine will unlock autographed gear by Turner. If Kiké Hernandez (another Adidas athlete) makes a diving catch in the outfield, then expect the vending machine to unlock a pair of autographed cleats from the super utility star. The machines debuted last night and from the photos below, fans were loving it. The amazing idea is meant to promote Adidas' new line of "Splash Pack" cleats that debuted on their website and in stores during the MLB postseason. The cleats are inspired by postgame celebrations like champagne showers, Gatorade baths, and more.